What is the physical address of your quilt shop? What are your quilt shop hours? How do I get to the Gathering Friends Quilt shop? Please refer to our map at the bottom of the homepage for directions. If you need additional help, call the store and we can help you – (320) 365-4670. Are buses welcome at Gathering Friends Quilt shop? Absolutely!! We love having buses stop in. We have plenty of space (and bathrooms) to accommodate large groups and restaurants within walking distance. Call the store for details – (320) 365-4670. How can I register for a quilting class? You can register for a class in person, by phone or by mail. Do I need sewing experience to begin a quilt? You need to know how to operate your sewing machine, we’ll teach you the rest. Do you offer quilting classes for beginners? Yes, it’s our favorite class to teach. Check out the class schedule on our website for details or call the store – (320) 365-4670. Can I sew at your quilt shop? We offer a variety of classes where we welcome you to sew at the quilt shop. Do you provide custom sewing quilting services? 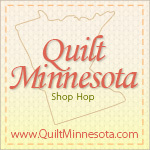 We don’t offer machine quilting services, but have a list of local quilters for you to check out. A fat quarter is a quarter yard cut that measures approximately 18″ x 22″ rather than the standard 9″ x 44″ quarter yard. How wide is your fabric? Typically, fabric is 42″ wide. Table runners are a good start. They’re great for learning technique. Although some items are nonreturnable, every situation is unique. Please call the store for details on returns – (320) 365-4670. We have a flat fee of $5.00 on all orders within the continental US. Alaska, Hawaii and International rates will vary. We do ship outside the US, those rates will vary. The majority of our shipping is done through the US Postal service. What if I want to receive my order faster than normal delivery time? Contact the store and we can expedite your shipment for an additional fee – – (320) 365-4670. What information is provided in your quilting books? Our books are soft cover, 8 1/2″ x 11″ and have a color photo of each project in the book. They contain 12 or more projects and all the instruction needed to complete them. What is included in a Quilt Kit? Everyone loves the convenience of a kit and the fabric selection is all done for you so you have a quick way to start a new project. Our kits contain all the fabric you need for the top and binding of your quilt. What type of fabrics do you sell? The majority of our fabric is 100% cotton and flannel. We also offer minkee and polyester for a bit of texture. What type of patterns do you sell? We carry our original designs and other pattern designers for a variety of projects from quilts to bags to children’s clothing. What type of quilting tools do you offer? If you’re looking for a tool and can’t see it on the website in the Tool Box section, please contact the store at (320) 365-4670. We carry a large selection of tools. If we don’t have it, we can get it. Go to the My Account section of the website and login to your account. From there you can see the status of your order. Go to the My Account page and click the “Lost Your Password?” link. Complete the steps and you will be emailed a link to create a new password. How can I change my e-mail address or my password? Go to the My Account section of the website and login to your account. From there you can click on the “edit your password and account details” link and update your information. You credit card will be charged as soon as you submit your order request. Please contact the store immediately at (320) 365-4670 and we’ll take care of it.